What are the delivery timings and fees? Do you have a shop? Can I self-collect/visit you? Can I collect my orders from your stockists? Can you split my order and deliver them on 2 different days or 2 different locations? How many days in advance do I need to place my order? Can I cancel an order or get a refund? How many calories/ What's the macros of your products? Are your products suitable for Muslims? Which items are keto/low carb? Are your products certified gluten-free or allergen-free? Why do you use palm shortening? Isn't it bad for our health/environment? Is there xanthan gum or other gums in your products? This question is valid only for deliveries within Singapore. :) If you're outside Singapore, please see this Q instead. Flat SGD $8 island-wide. Orders above SGD $80 get free delivery, yay! Only 2 delivery time slots: Day (9am - 2pm) or Night (5pm - 10pm). Deliveries will be made any time within these time slots and you can't choose an exact timing. 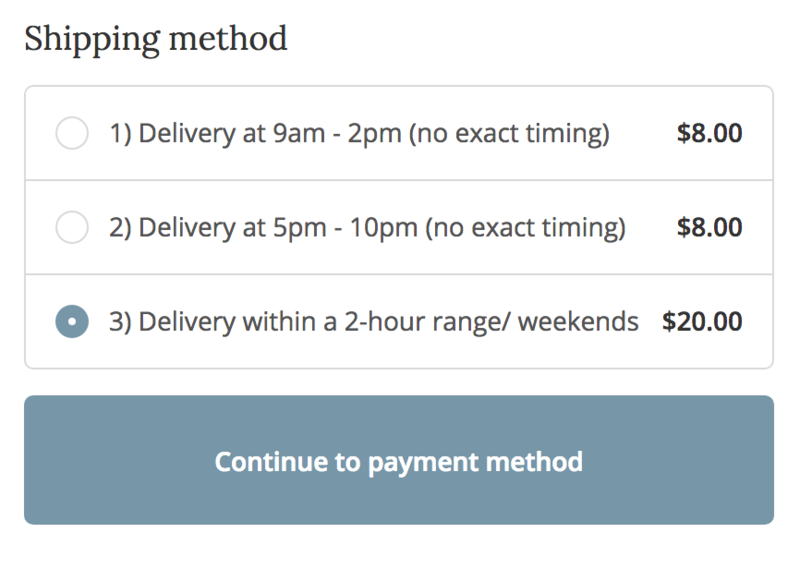 If you must have delivery on weekends or a specific 2-hour window, there will be an additional charge of SGD $12 on top of the normal delivery fees. Kindly ensure that someone will be around to receive the delivery during your chosen time slot. Otherwise, redelivery will be charged at SGD $8 per trip. Yes, cookies and cereals can be shipped internationally. We apologise that we're unable to ship all other items as they require temperature control. Shipping fees will be calculated automatically at checkout. Get 12 packs and above for free international shipping! No, every order can only have 1 delivery date to 1 location. Please place 2 separate orders instead (1 order per date per location). This helps you to choose the correct shipping option (and makes things less confusing for us too ;)). No, we strictly do NOT bake until full payment has been made. Orders not paid at least 3 days before delivery date may not be fulfilled. We need a minimum of 3 days' advance notice before your delivery date. You can place your order up to 1 month in advance. Yes, please see our Refund Policy for conditions of full or partial refunds. Yes, we can customise cakes with simple decorations or with additional ingredients. Let us know what you want and we'll see if we can work it out. We typically charge an additional SGD $20 - $40 for the extra time required to make customised orders. Please note that we do not guarantee the quality of customised orders. For all other items (e.g. breads, cookies), we apologise that we're unable to do any customisations for them. You can find the nutrition information of our products on the product pages. It's usually the 3rd or 4th product image. Which items are keto-friendly/low carb? Our keto-friendly/low carb items are mainly breads. We also have a sugar-free chocolate cake made with erythritol. We have our own baking facility and only make paleo, vegetarian, gluten- and dairy-free products. While all our ingredients are gluten- and dairy-free by nature, please note that we don't send our products for allergen tests and they're not certified. We take extra care to prevent cross-contamination but we can't give a 100% guarantee that our food is free from allergens. Can we freeze your products? All our breads, cakes, and muffins can be kept frozen for a month. :) To keep them at their best state, freeze them on the first day of getting the products. Prevent them from drying out by keeping them in air tight containers or wrapping tightly. To consume, thaw overnight in the chiller. After thawing, keep them in the chiller and finish the products within 3 - 4 days. Please do not refreeze thawed food as it may become unsafe for consumption. Paleo simply means eating what our bodies have evolved to digest and get nutrients from. Read more on our About page. If you didn't know, palm shortening isn't made the same way as vegetable shortening. It's NOT hydrogenated and doesn't contain any trans fat. When sourced sustainably, palm oil is actually one of the best choices for the environment. Erythritol is a sugar alcohol found naturally in plants, unlike artificial sweeteners. It has zero calories and zero glycemic index (does not cause blood sugar to rise), and is suitable for diabetics. However, it does have a slight bitter/metallic aftertaste, hence we do not recommend this option unless you have blood sugar issues. Pls see the pros and cons here. Xanthan gum and other gums are binders commonly found in gluten-free products. However, we do not use any gums as they are known to cause irritation to the gut (e.g. diarrhoea, bloating, increase intestinal permeability) and are not suitable for people with leaky gut. Ironically, xanthan gum is also commonly contaminated with gluten.